Pre Heat oven to 375 Degrees fahrenheit. I start with 3 bowls. Mix wet with dry until just mixed then fold in fruit. use the topping crumbles and top each muffin before you put in the oven. I make 8 large muffins but you could easily get 12 smaller. 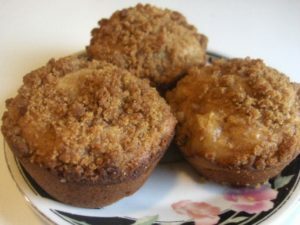 This entry was posted in Recipes and tagged Apple Pie Muffins, Apple Pie Muffins recipe on August 30, 2017 by admin.